The library can compare different faces, returning the degree of likeness. This allows identifying human faces appearing in still images or video streams by looking up face databases. Recognizing and identifying still images enables locating similar faces in driverвЂ™s license databases while helping detect duplicates. The system implements image indexing, creating compact templates for faster searching. This in turn allows building a range of security applications such as video surveillance and real-time access control systems. Many more features and higher performance are achievable in video-based surveillance systems using the new set of motion-based recognition algorithms. FaceSDK is designed to perform equally well under varying lighting conditions. It works fine under daylight, fluorescent and incandescent lighting. When testing on a FRGC database, the library successfully identifies individuals in 93.9% of cases if acceptable false positive is 0.1%. Luxand FaceSDK returns coordinates of all human faces appearing in the picture вЂ“ or notifies if no face is found. FaceSDK can track all faces appearing in a video stream. It allows finding out if a new face appears in the frame, or if one of the subjects leaves the frame. This in turn enables easy implementation of people counting. When testing on the FERET dup1+gallery database (frontal passport-like photos) successfully detects 99.5% of faces, with only 0.05% false positives. FaceSDK detects coordinates of both eyes. Its high performance allows using this function on still images as well as in video streams in real-time. The ability to track eye movements enables building a variety of entertainment applications such as trying eyeglasses. An average error on FERET dup1+gallery is 3.1% of inter-ocular distance, while in 95% occurrences the error is less than 5.7% of inter-ocular distance. What do these numbers mean? They mean that, on average, if there are 100 pixels between the eyes, the eyes will be detected with the precision of +/- 3 pixels; and even if the error is greater than that, in 95% itвЂ™ll be less than 5 pixels. Luxand FaceSDK employs sophisticated algorithms to detect and track facial features quickly and reliably. The SDK returns the coordinates of 70 facial feature points including eyes, eye contours, eyebrows, lip contours, nose tip, and so on. The detection works in real-time on desktop and mobile, which allows performing smooth real-time tracking and transformations of facial features in live video. On desktop platforms, FaceSDK delivers true 60-fps performance on video streams, while video processing on mobile platforms such as Apple iPhone 6 is performed at 30 fps in landscape orientation (and in all orientations on devices with more powerful platforms). The feature enables building applications adding new elements such as mustaches, eyeglasses or wigs; face morphing and augmented reality. By using FaceSDK, we built Mirror Reality SDK that transforms faces in real time by detecting facial features in a video stream. Developers can implement mechanisms to analyze faces detecting emotions or rotation angle. Morph, animate, or transform human faces with the SDK! FaceSDK can automatically identify subjectвЂ™s gender based on a still image or motion stream. This feature is in high demanded by retail advertisers and marketing specialists. Identification quality is 93% on still pictures, and 97% in videos. FaceSDK automatically recognizes the personвЂ™s age based on a single still image or a handful of frames from the video stream. Depending on source quality and lighting conditions, error rate is +/- 5 years. Age recognition can be used to track age of your visitors or customers. In addition, smart robotics applications will benefit from age recognition. FaceSDK helps detect human emotions by implementing facial expression recognition. The feature helps implement happiness meter and build applications that can detect blinking and sleeping. Facial expression recognition detects whether the person appearing in the picture or in a video stream has her eyes open (nearly 100% recognition rate on our internal tests) or whether the person is smiling (92% recognition rate). FaceSDK supports all DirectX-compatible webcams that work in Windows. In addition, it supports all MJPEG IP-cameras on all supported platforms, including the popular AXIS range. This is just perfect for security, surveillance and access control applications, as the use of IP cameras allows getting information remotely from distant cameras. This also allows integrating FaceSDK into existing surveillance infrastructure. FaceSDK includes a number of functions to load and manipulate images such as.bmp, .jpg, and .png, as well as memory buffers. The library can be used to resample images, rotate, crop, flip, and perform pixel-level editing. The files can be saved into the same format. These features are handy for building imaging applications even if you donвЂ™t immediately require any facial recognition features. The library supports multi-core processors to boost the performance of face recognition, face detection, and facial feature detection. TodayвЂ™s multi-core CPUs such as Intel i5, i7 and Xeon are used to their full potential. The library is completely thread-safe for using in multiple concurrent threads e.g. when receiving video streams from a large number of video cameras. LuxandвЂ™s patent pending technology detects facial features quickly and reliably. The SDK processes an image, detects human faces within it, and returns the coordinates of 70 facial feature points including eyes, eye contours, eyebrows, lip contours, nose tip, and so on. Powered with sophisticated facial feature detection, Mirror Reality technology augments reality by altering a personвЂ™s appearance. Still pictures of human faces can be completely transformed, and video streams automatically change into enhanced reality. Developing morphing, animation, or 3D software? Create a perfect ‘skin’ or a 3D head model automatically! The SDK can detect human faces and return the coordinates of facial features, making it easy to match facial features in the photograph with corresponding features on the 3D head. Make a perfect ‘talking head’ avatar for your online applications with a single photograph of a human face. Current generations of 3D head modeling software require manual selection of major facial features such as eyes, nose, and mouth to match them against the same features on the 3D head model. The manual intervention is required to create realistic 3D heads, and is an absolute must if you want animation. The SDK automates the task, allowing you to make new avatars on the fly. Imagine letting your customers upload their pictures and immediately receive their animated avatars! 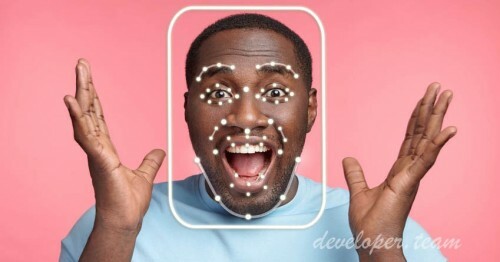 The SDK recognizes the face in a photograph and returns the coordinates of facial features in a list of anchor points. Your software can easily match facial features such as eyes, mouth, nose, and ears to the points on your 3D head model, creating a head that looks and moves like the original. The SDK is implemented as a highly compatible library that works with all 32 and 64-bit versions of Windows and Linux, with 64-bit Macintosh, iOS 5.0+(armv7/x86), iOS 7.0+(arm64/x86_64) and Android, and supports many popular development environments. Microsoft Visual C++, .C#, VB.NET, Netbeans (Java), Xcode (iOS), Eclipse ADT (Android), Android Studio (Android) and Borland Delphi users get all necessary header files, making it easy to integrate with new or existing projects. Revamped face detection engine with improved detection rates. Significantly improved detection of faces in complex lighting conditions, blurry and noisy streams, as well as angled faces.